Organizing friends, get ready for some visual lust. Last week I had the opportunity to join in with a fabulous group of local bloggers to tour the brandy-new Buckhead location of The Container Store! The Container Store, which proudly says that they never close stores, they only move stores to bigger and better locations, is a favorite spot for city dwellers like me. Whether you are living in tight quarters like a condo or apartment, or in a larger home with so much space that you don't know what to do with yourself (I envy you! ), The Container Store has you set. No other retailer offers the depth and breadth of storage solutions that The Container Store does. I was so honored to be invited to the preview event at the new location. The Container Store outdid themelves this time! The new space is gorgeous, and makes you want to run home and tear every piece of clothing out of your closet and start over with a new organizing system in place. I had to literally hold myself back from the displays as we got a tour. My OCD side was in absolute heaven. Did you know? The Buckhead store location, originally at the intersection of Peachtree and Piedmont, was The Container Store's first store outside of Texas! Our store goes way back, y'all! This new 28,000 sq. foot, two-level store is now at the corner of Peachtree and Wieuca, and takes the place of the Borders that closed many months ago. I had heard about the go-getter attitudes of the associates at the stores, but was surprised to learn how that comes about. Each full-time salesperson gets more than 263 hours of training in their first year. That is compared to a retail industry average of only seven to ten hours. Wow. These people know what they are talking about! 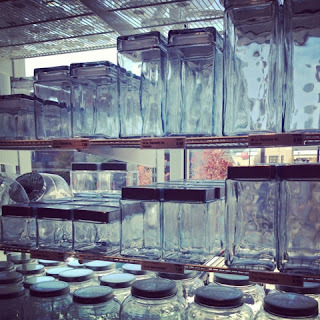 The Container Store is home to more than 120 food storage solutions (seen below on this amazing curved wall at the back end of the store which faces Peachtree Rd. ), 700 organized office products, 45 types of laundry hampers, 350 products to organize a traveler, 80 styles of hangers (seriously - see that wall of them above!) and more. 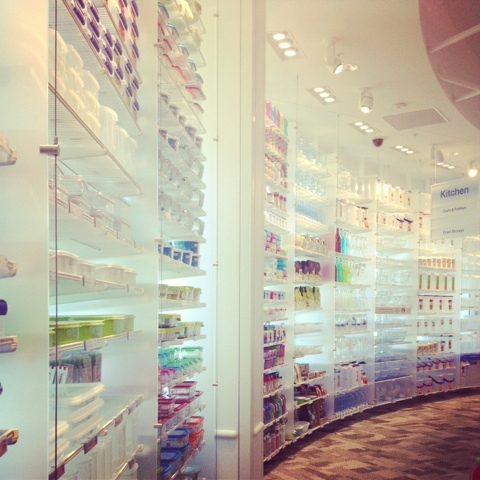 This store alone features more than 10,000 multifunctional and innovative products. One of the items that caught my eye were the clear shoe boxes. Retailing at $1.69 each when you buy 20 or more, they are totally clear and see-through. You know how you usually have to put a photo or a label on the front of some other "clear" box so you can tell your black stilletos from the dark purple ones? You don't need to do that on these -- you can actually see right through them because they are made of such a high-grade plastic. 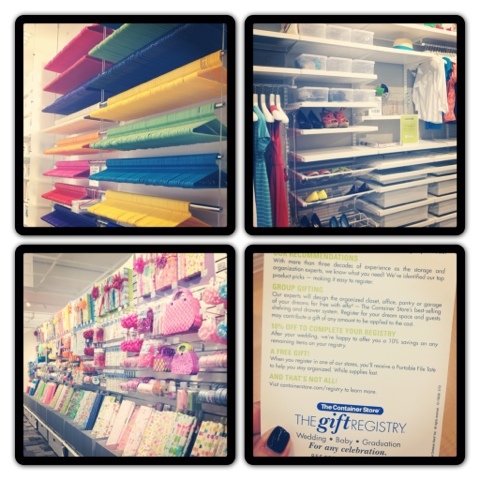 Another thing I was excited to see -- they now offer a registry! Obviously, this is awesome news for fellow organized brides, but also for recent high school and college grads, new homeowners and new parents (hello, baby food containers!). Ready to get your OCD on? This brand new addition to the Buckhead shopping area is open Monday-Saturday, 9 a.m. to 9 p.m. and Sundays from 11 a.m to 6 p.m. Parking is available in front of the store by the CVS and Pinkberry. Learn more about The Container Store's principles, community events and celebrations on their blog, What We Stand For. Disclosure: I was invited to and attended a grand opening luncheon hosted by The Container Store, and received products as part of that event. This post represents my own opinions.